Unfortunately, this floor scrubber has been discontinued by the manufacturer as of 1/1/17. 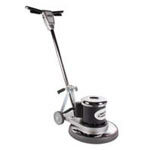 Please check out our Trusted Clean 13 inch Floor Cleaning Machine for a comparable machine. Also, feel free to look at our full line of low speed floor scrubbers to see which products we do have readily available.